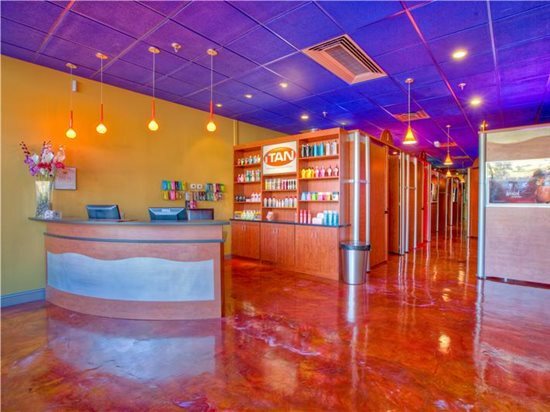 The metallic floors at this tanning salon wow their clients as soon as they enter the building. Custom Concrete Solutions, West Hartford, Conn.
Metallic coatings may look exotic, but they are installed similarly to a typical epoxy coating or overlay, so the learning curve is relatively low. And by experimenting with different tools and application techniques, you can achieve a vast array of decorative effects. Here's what you need to know to get started. Where can metallic coatings be used? What sort of concrete surface prep is required? As when applying any coating, you should make sure the concrete is clean, dry, and free of grease, paint, oil, dust, curing agents, or any foreign material that will prevent proper adhesion. To aid in bonding, the concrete should also be roughened, or profiled, until it feels like 50- to 80-grit sandpaper, using methods such as grinding, shotblasting, scarifying, or water blasting (see Concrete Surface Preparation). Also make sure that concrete is level, since any high or low spots will distort the final look. With metallic coating systems, the surface should be primed with a pigmented epoxy base coat, not only to improve coating adhesion but also to provide a solid background color for the iridescent metallic pigments. On this project, for example, a black primer was applied to add depth and dimension to a blue epoxy enhanced with metallic powder. The primer color can be varied, depending on the look you’re trying to achieve. How are metallic coatings mixed and applied? Most metallic coatings are two-part 100%-solids epoxies, and simply require mixing Part A, Part B, and the metallic pigment. Often the pigments are sold separately so you can experiment with different color effects. 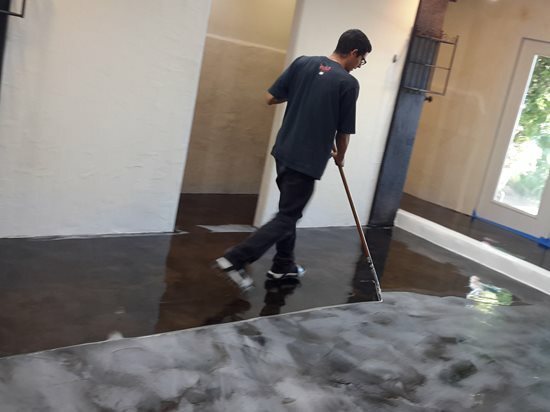 Because epoxy coatings are flowable and somewhat self-leveling, you can spread them on the floor surface easily with a trowel, roller, or squeegee in a random back and forth motion. After the coating has cured, a clear topcoat may be applied, if desired, to achieve greater scuff resistance and gloss. Here a metallic epoxy is being applied to a black base coat while it is still wet, next a solvent will be broadcast over the entire surface to achieve a mottled finish. A Seamless Floor Company, Queen Creek, Ariz.
How do I achieve special effects when applying metallic epoxy coatings? Depending on the look you’re after, you can use a variety of tools and techniques to create dramatic decorative effects. Some contractors will spray the surface with denatured alcohol soon after the coating has been applied to disperse the metallic pigment. Another option is to use a notched squeegee or even a leaf blower to distribute the epoxy around the floor and produce a rippled effect. To create dramatic swirls of color, you can sweep over select areas of the floor with pool trowels attached to long wooden handles. You can also create unusual color variations by drizzling, splotching, or blending one or more metallic pigment colors over the top of the base color. To see examples of some of the unique effects possible with metallic coatings, check out these projects: Adding Dazzle with Metallic Coatings. Can metallic coatings be used on both indoor and outdoor surfaces? Metallic coatings are generally not recommended for outdoor surfaces because they may discolor when exposed to direct sunlight. However, they offer excellent impact and wear-resistance on high-traffic interior concrete floors, especially when protected by a clear topcoat.